Very nice and solid piece of furniture. Shipping was very fast and assembly was easy. Very sturdy to sit on and white color is very bright. Would highly recommend! Enhance both the function and beauty of your foyer with this Bermuda hall stand. Four double hooks provide room for family and guests to hang up outdoor wear, and upper cubbies and a lower storage compartment offer organization for your stuff. You know how some things are that cheap, flimsy stuff that falls apart or is weak? That is not the case here. This is a quality, sturdy product. Heavy to put together for one person but, a lot easier when you a) have room and b) someone to help lift near the end. Lots of pieces and some confusion on the directions but, some patience and thinking makes it go together. I would not hesitate to buy again. We have this by our garage door and use it every day. Love this hall tree!! It is just the right size for an entry hall in my home. My husband put it together wuickly, without complaint so it must have been pretty easy!! I would have given 5 stars but there was a small crack where one of the bolts that hold the back shelf on. It will need to be glued and clamped. The other problem came with the screws holiding the door hinges. They are too rounded and don't seat all the way down, allowing the doors to stay closed. So they need to be changed to flat head or a little recess drilled out so they seat down in completely. Other than that it was easy to put together and looks beautiful. It's a little smaller than expected but fits my space beautifully. Overall very satisfied. Looks nice, easy to assemble. Normally I don't write reviews for products, but I wanted to submit one for this hall bench. I hesitated on buying it for 2 months, wondering how it would be to assemble and what the quality would be like. First of all - very fast shipping. It was easy to assemble, all the parts were clearly marked and everything fit in the holes properly. The only time I needed help was when I needed to put the top section onto the bench. It looks great, just like the photo. It's not overly tall, but I checked the measurements before I ordered. I am very pleased with it. 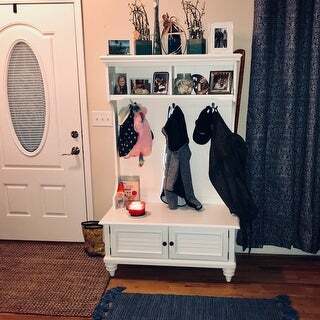 It fits nicely in our mudroom. This arrived in the mail. As I was unpacking it, I was a little intimidated. After carefully laying out all of the parts, assembling the piece was smooth sailing. 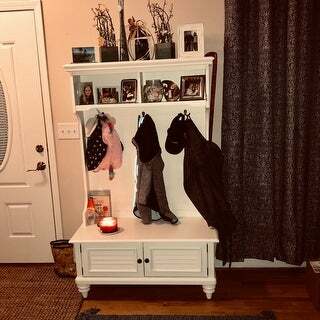 Two of us girls easily built this while watching a Christmas movie and sipping on ice coffee. One thing to keep in mind when you assemble - make sure you have the screws that go into the cam locks tight - otherwise they don't grab The only part of the directions that I took me a few minutes to figure out was the first few directions for the top piece. The instructions had the picture with the piece laying down...this was impossible because the cam locks are on the back. Luckily my girlfriend did a great job at holding things straight while I lined things up. The finished product is SOLID!!! This is as nice of a piece as I could buy in a furniture store. I even stood on it to hang something over it.... It is beautiful...perfect. I was a little disappointed - it is not as tall and huge as the picture makes it look. I expected this to be way taller, not sure why, I read the measurements. I also expected the cubbies at the top to be deeper, but oh well. This is perfect. Buy it. I wish I could take a picture for you. 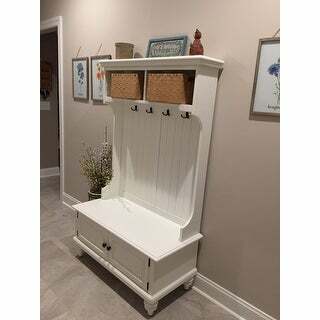 Very nice hall stand. I have it in my bathroom. Good storage and strong construction. Can sit on it without concern. easy to put together. We love this storage bench but wish it was just about a foot taller. We've used it in two homes and it has served us well. Would work well with lower ceilings. Well packed and Nice piece of furniture. My one issue was the doors and hinges are not aligned properly. It took more time to put the doors on than to put this entire piece together. We really liked the hall tree. It’s of high quality and looks really nice in the foyer. The only issue I had with the hall tree is that the hooks are not high enough. We could only hang short jackets or coats. Any men’s jackets or longer women’s jackets or coats hit the bench and look messy. wood had some cracks from shipping but not to the point that parts needed to be replaced. You need 6 hands to assemble. Doors need better closing magnets. This came to me in perfect condition and is gorgeous in my entry. I've admired for years on Ballard and am thrilled that although it was discontinued there, it was available at Overstock for less. arrived in a timely fashion, in a very sturdy box...in perfect condition the quality is above average, nicely finished...solid as can be(weighs over 100 lbs) my nephew surprised me and assembled it while I was gone, but he said it wasn't too hard to put together, but there is a lot of parts. I highly recommend this piece if you have someone to help you or have the skill set to assemble yourself...it's absolutely darling! Super cute. I was worried it wouldn't match my walls, but it was perfectly matched with my walls. It is very solid and easy to put together. I will be looking for another hall piece that matches. This is a beautiful addition to my country décor. Was a little challenging to assemble but I managed. Would definitely recommend, worth the purchase. Furniture is excellent but the assembly instructions were very unclear. 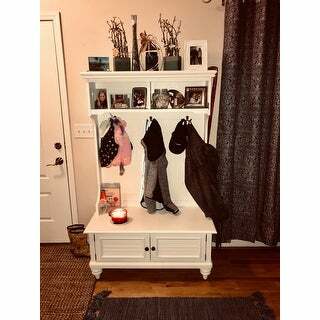 Great quality, love the bottom storage, and a classy addition to our mudroom. Great quality. Looks nice, too. Great piece of furniture. We are using it to keep all our kids' backpacks and jackets organized. "Most reviews mention using it for coats and leashes. I want something that could hold my kids backpacks. Are the hooks intended to lighter items?" The back packs should be able to hang on the hooks. "How tall is the unit without the feet? Can it be used without the feet? I’m looking for 60 inches or less..."
"What is the distance in inches from the floor to the bottom of the unit? E.g., how long are those short legs? This will sitting against baseboard heating and I would like it to sit “above” the baseboard, not in front. The length of the baseboard is only 33” so that won’t be an issue." The height of the legs/feet is 4 ½” in height. "Is this hall tree BRIGHT white? Thank you." No it’s not obnoxious white, just perfect i believe! Love mine! "What are the dimensions of the top of this piece? " The top of this piece is approximately 40 inches wide x 18.5 inches deep x 64.5 inches high. "I would like to purchase a cushion for this bench. I know the overall length is 40 in. and the depth is 18.5 in. but what is the measurements of the seating area of the bench?" "Hi Is the back side of this unit finished so that it can be free standing or the side placed against a wall creating a room divider? Thanks"
Yes, the back side is finished as well. Yes, the back is the same white finish. I would like to say there's lots of silver screw heads that show on the back.